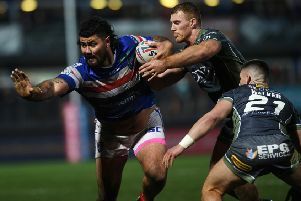 Winger Justin Carney scored four tries as Castleford Tigers romped to a 58-20 win at Wakefield Trinity Wildcats on Sunday afternoon. Five tries in 12 minutes either side of half-time sung Wakefield, after it had been 12-12 a minute before the interval. Reece Lyne’s try and the first of Joe Arundel’s two goals gave Wildcats an early 6-0 lead, but Grant Millington and Luke Gale - who finished with nine conversions and had an outstanding game - hit back for the visitors. Anthony Walker’s first try levelled the scores, but Mike McMeeken went over on the final play of the first half and Oliver Holmes, Luke Dorn and Carney (twice) touched down to give Tigers a 40-12 lead on 51 minutes. Wakefield steadied the ship with back-to-back tries by Tom Johnstone, cutting the gap to 20 points, but Cas finished strongly. Carney went over on 73 minutes, Dorn added his second and the winger went in for the fourth time on the last play of the game. To add to Wakefield’s woes, they lost full-back Kevin Locke, who was hurt attempting to prevent Millington’s try. Denny Solomona, who has scored in Tigers’ previous six games, also hobbled off in the first half.